In Shropshire, Staffordshire, Shrouds & Shoes I said I’d start to piece together my husband’s family tree. The project was inspired by my mother-in-law. She was very enthusiastic about it and retained that enthusiasm throughout. But sadly, as her health deteriorated, I found it wiser to quietly drop my research. I found she was becoming so involved she could no longer distinguish between past and present, fact and false memory. An example was frantic phone calls and threats to summon the police in the middle of the night because she had time-travelled. She was convinced she was back in the 1950s. It turned out she’d dug out some old newspapers before going to bed, woke up in the early hours, started reading them then saw the date. Things reached crisis point at the beginning of December when she was admitted to hospital on a long-term basis. In hindsight her detention has been a blessing as we now have a definitive diagnosis, Alzheimer’s, and she is finally able to access the correct treatment. She is now is out of hospital, the illness has truly taken hold, and she is no longer has her own home. In the process of clearing it we discovered more family papers which I will go through in due course, once things have settled down. But initially they have solved one mystery: the Captain Webb connection. He of the English Channel swimming fame. Even as far back as the early 1990s my husband had insisted they were related. He wasn’t sure how. My preliminary research yielded no obvious link. There was a common surname. My husband’s great great grandmother was Mary Webb. She was born in Adbaston/Flashbrook area of Staffordshire in around 1830. She married Joseph Haynes at Aston in Edgmond, Shropshire, on 10 February 1859. Joseph founded a wheelwrights business in Stone, Staffordshire. But I could see no link. However, my mother-in-law’s papers seemed to indicate Mary Webb was the supposed connection. Captain Matthew Webb was the son of surgeon Matthew Webb and his wife Sarah Cartwright Garbitt. They married in 1845. Matthew was a bachelor, aged around 32, at the time of his marriage. Their second son, Matthew of the swimming fame, was born in Dawley, Shropshire in around 1848. He was baptised in Dawley Parish Church on 9 March 1848 and the entry is annotated with the words “Swam the English Channel August 25 1875”. In contrast Mary Webb’s baptism took place on 7 March 1830 at Adbaston Parish Church, Staffordshire. She was the daughter of William Webb, a wheelwright, and his wife Ann. Her father’s name is confirmed on her marriage certificate. It is also detailed in various newspaper marriage announcement columns, including the “Wolverhampton Chronicle and Staffordshire Advertiser” of 16 February 1859. This goes on to say for 12 years she had been a valuable and faithful servant for William Sillitoe Esq., The Bridge, Newport. The 1851 census shows her as a house servant in this household. I’m not ruling out a Webb connection further back. But if the link was supposed to be as stated, that my husband’s great great grandmother was the sister of Matthew Webb, it is false. As a result, my husband’s claim to family history fame seems to be on very dodgy ground with the flickering match flames rapidly extinguishing. And the Webb family have one bunch fewer kinsfolk. So be prepared when you start out looking into your family tree – you may end up disappointed and learning things you’d rather be oblivious to! This is, I hope, going to be an on-going record of my progress in researching a family tree from scratch. This recurring section of my blog will record my research highs, lows, successes and failures, brick walls and hopefully their demolition. I have no set timetable to complete this, so there may be gaps of several weeks between updates. But finally I aim to piece together the history of my husband’s family and write some individual stories. Part 1 describes the preliminary phase of my research. This particular project is inspired by my mother-in-law. A few weeks ago she announced she had a family bible, complete with a record of a couple’s marriage and the births and deaths of their children. There was also a series of non-conformist quarterly meeting cards. 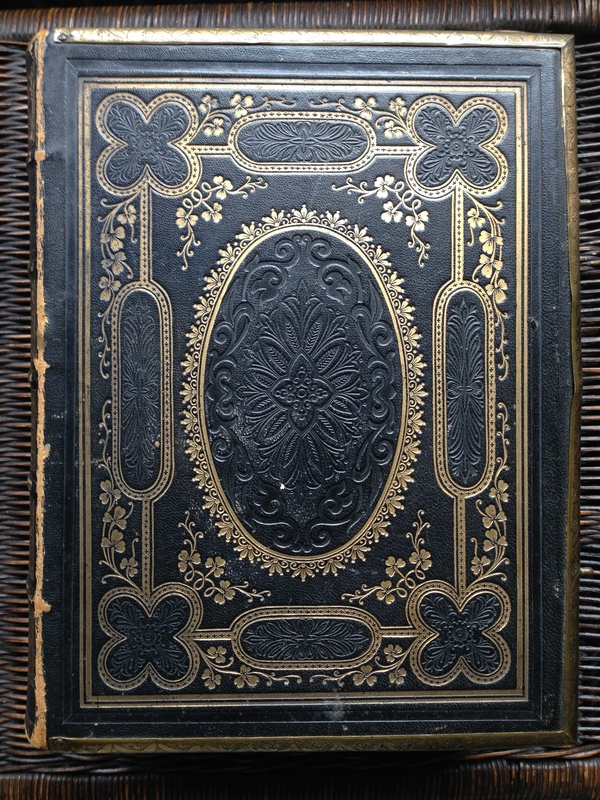 She was unclear exactly how they connected to her and so she loaned me the impressively weighty Victorian tome to see if I could discover more. Within days she added to this treasure, with the discovery of a totally unrelated bundle of documents containing assorted certificates, an apprentice indenture, baptism and burial documentation, and a will linking to various branches of her maternal and paternal line along with some others connected to my now deceased father-in-law’s family. So a wealth of documents to get me started, far more than other families I have researched. I feel a bit like a kid in a sweet-shop – so many choices. But I am focussing on one branch at a time rather than adopting a scattergun approach. And I am being disciplined in recording my information sources, as well as any searches (both succesful and unsuccesful), far more so than when I started our researching my family tree. Hopefully this will save time as I progress. With this in mind my first line of research is my mother-in-law’s paternal line, starting with her father William John Haynes. The reason for starting here is that his is the most complete set of documents in the parcel of papers, with his birth, marriage and death certificates along with various other papers chronicling the key stages of his life. The bible does not relate to this branch of the family. William Haynes’ birth certificate states that he was born on 27 February 1904 at Elford Hill, Eccleshall, Staffordshire. He was the son of master wheelwright, Joseph Thomas Haynes and his wife Maria (neé Yates). By the time of William’s marriage to Ada Eardley on 15 September 1929, William’s father was described as a funeral undertaker. This information was a catalyst for a rather unusual memory for my mother-in-law. She recalled staying at her grandfather’s house and sleeping in a bedroom full of shrouds! According to GRO indexes he died in 1958, in his early 90’s. A preliminary search revealed that J Haynes undertakers still exists at Eccleshall, with the website providing a brief resumé of the buisness. So in my later research I intend exploring the life and business of Joseph Thomas Haynes. However, based on the information provided by my mother-in-law, my first week or so’s research has centred around the 1841-1911 census returns and the odd foray into parish records. 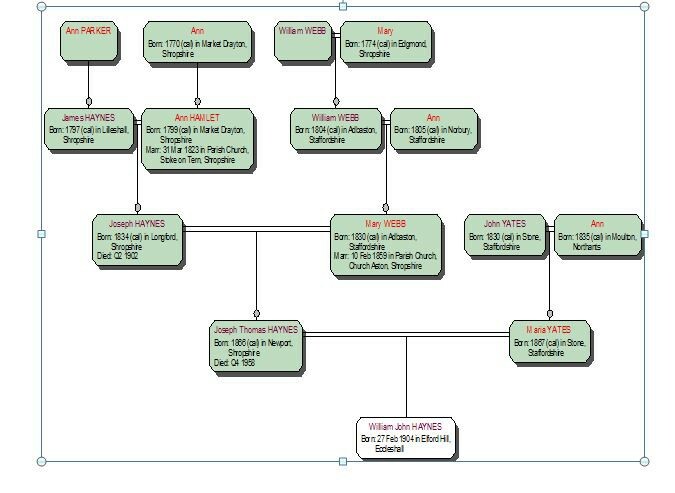 Using this combination of online sources I have constucted a basic skeleton of a family tree. This is reproduced below. The census search has proved fairly routine. No real difficulties tracking back to 1841. I used both the Ancestry and FindMyPast UK sites to do this. 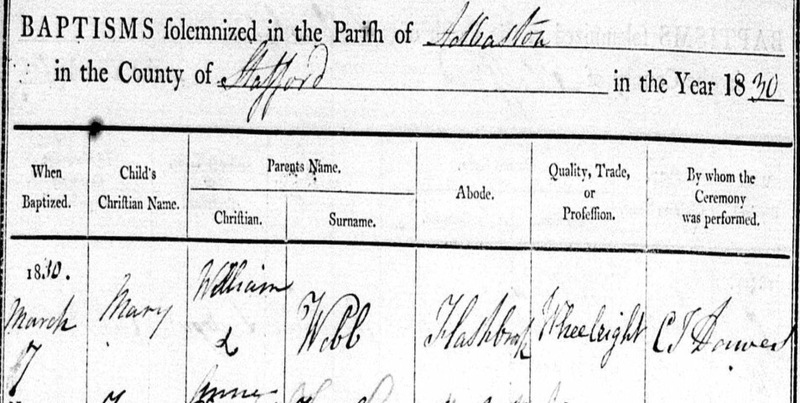 The only minor hurdle was finding William’s great grandfather, James Haynes, in the 1851 census. Although he was there in the 1841 census and then from 1861-1871, there was no trace of him in 1851. At this point I consulted on-line parish registers available for Shropshire on FindMyPast. Through the censuses I had located seven possible children for James Haynes and his wife Ann. I then identified their baptisms in the Parish Registers for the parishes of Edgmond, Longford and Church Aston in Shopshire. This provided the breakthrough. The youngest children bore the surname “Haynes Parker” or “Parker Haynes”. Only the youngest child George was born post-GRO registration. His baptism in 1838 is under the name Haynes-Parker, his GRO registration surname is Parker with Haynes being listed as a middle name. Eldest child, John, was baptised on 10 January 1824 at Edgmond Parish Church with the surname Parker and no mention of Haynes. From this information it was now easy to locate James in the 1851 census – recorded under the name Parker not Haynes. It also proved a breakthrough in locating James’ marriage. At the time of the 1851 census James’ mother-in-law Ann Hamlet resided with the James and Ann. The Parish Register of Stoke on Tern, Shropshire has a marriage on 31 March 1823 between James Parker and Ann Hamlet. The Shropshire Parish Registers also provide a possible baptism for James in June 1797 at Lilleshall, illegitimate son of Ann Parker. So if possible I would like to find out a little more about the reason behind this transistion of surname from Parker to Haynes, which took place during the late 1820’s to the early 1860s. James’ son Joseph (1834) is the grandfather of William Haynes. Born in around 1834 the Shropshire Parish Registers show that he was married by licence at Aston in Edgmond on 10 February 1859. His bride was Mary Webb, daughter of William. 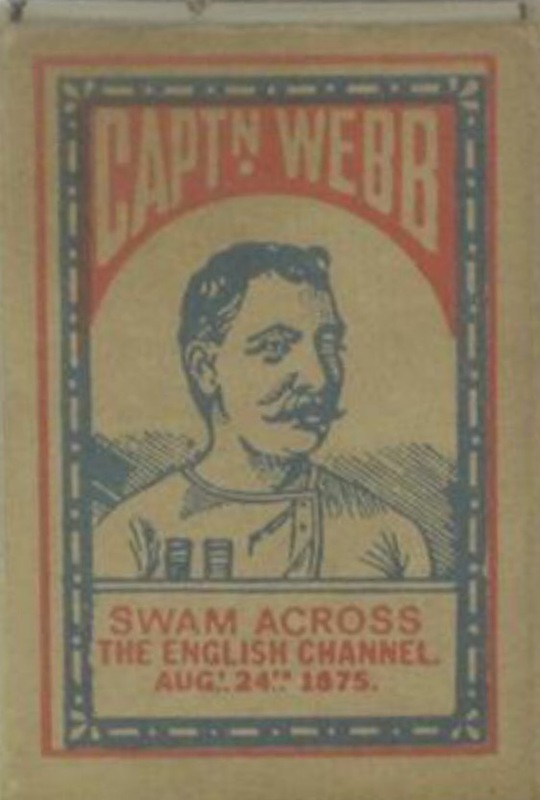 My husband says there is a family story that they are somehow connected to Captain Matthew Webb, the first recorded person to swim the English Channel. As yet, even despite this now shared surname, I have found no evidence to support the anecdote. My husband’s Webb Ancestry from the 1800’s appears to be Staffordshire based, with pre-1800s possibly Shropshire. A preliminary look at Captain Webb shows he was born in Shropshire in 1848. But it is something else to explore. Of more immediate interest is an occupational connection between William Webb and the Haynes male line. They were all wheelwrights. By the turn of the 19th century the Haynes family were diversifiying adding building, joinery, carpentry and undertaking to their trade skill set. In the late 1860’s they moved from Shropshire to Stone, Staffordshire to ply their trade and appear to have been extremely succesful at it. I had a quick look at the image archive on the Staffordshire Past-Track website and was amazed to find images of Haynes and Sons, Wheelwrights. 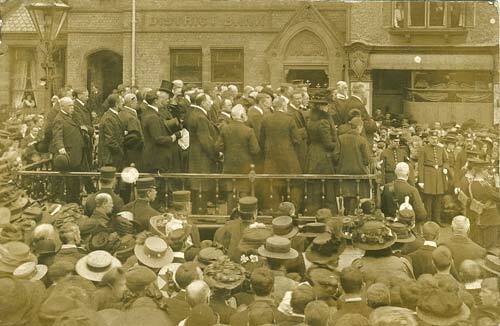 This contains photographs of family events as well as ones of their business, including images of portable bandstands (one produced below) manufactured by the family firm. So again this is another aspect of the family history I intend exploring. Finally I quickly looked at the family details of William’s mother Maria (neé Yates). Her father John was a shoemaker, born in around 1830 in Stone, Staffordshire. John’s wife Ann and all his children were engaged in this trade. I traced John back to the 1841 census, living in the household of bricklayer James Thornhill and Ann. Other household members included George Yates (14) and Joseph Yates (7). From GRO indexes it appears that James Thornhill married Ann in 1838. So this is a certificate I would like to obtain to see if Ann’s name was Yates and to find out her background to see how this fits in with John. I think the most satisfying aspect of researching my mother-in-law’s tree is her sheer delight at each new discovery. Of late she has struggled with memory issues, but this research is rekindling long forgotten episodes in her life. It is an absolute joy for all concerned when some new find triggers the recollection of something buried deep in the recesses of her mind; or, because she knows I am working on her tree, she suddenly recalls some other fact or story. For example she thought her family routes were in Staffordshire, but when I identified a significant Shropshire connection she recalled her parents visiting family in that county. So this process is proving fascinating for me and an interest for her. My next steps will be to try to flesh out the tree further with online parish records and the ordering of BMD certificates (oh, for that certificate price reduction, but sadly this research cannot wait!). Then to try to fill in the details of the individuals, their occupations and the times and areas in which they lived. I will return to this portion of my blog later in the summer. I say possible because of the omission of family relationship details on the 1841 census. With thanks to Staffordshire Past-Track and Mr David Haynes for allowing me to use this image. Copyright is retained by David Haynes who has kindly made his collection available to Staffordshire Past-Track for non-commercial private study & educational use. Additional information about permitted uses of content and commercial enquiries is available via the Copyright statement Copyright Statement on Staffordshire Past-Track. Re-distribution of resources in any form is only permitted subject to strict adherence to the guidelines in the full Terms and Conditions statement.